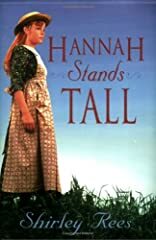 Hannah York is only fourteen, but she finds herself as the woman of the house as her family creates a home along Santa Rosa Creek during the 1860s. Her mother's death soon after their arrival in southern Utah tests Hannah to the limit, as the family battles crickets, floods, and drought. Her twelve-year-old brother, Caleb, who has always been her friend, resents her new authority and rebels at Hannah's orders, claiming she must be the "bossiest critter" in the Utah Territory. It takes a mountain lion, renegade Indians, and a domineering aunt to make the Yorks see how much they truly rely on each other. Hannah's story will keep you captivated as she confronts her challenges, and in the end, truly stands tall. About Shirley Rees (Author) : Shirley Rees is a published author of children's books. Published credits of Shirley Rees include Hannah Stands Tall.